If you’re planning a corporate event, festival, stage show, parade, or even a private party near the Pacific Northwest, you’ve come to the right spot! Let us know what you’re looking for and we will work with you to develop a performance that’s tailored to your needs. We can easily adjust show length and costuming, or even teach a samba reggae dance lesson to get the audience going. We’re busiest between May and August, so be sure to book early if you can. If you can’t, reach out to us anyway, and we’ll see what we can do! Please email bookings@vamola.org for information. VamoLá is a part of King County’s 4Culture’s Touring Arts Roster, a juried selection of professional performing arts groups in King County, Washington state. Performers on the Touring Arts Roster are well-known, dependable artists in the area. With us, you can check “find performers” off of your to-do list and rest easy knowing that we’ll put on a great show. We are a 501c(3) nonprofit, so donations to us are tax deductible. We’re pretty mobile. Our travel has taken us all around the Pacific Northwest, including Tacoma, Kent, Leavenworth, the San Juan Islands, Redmond, Bellevue, and Bothell, Washington, to name a few! 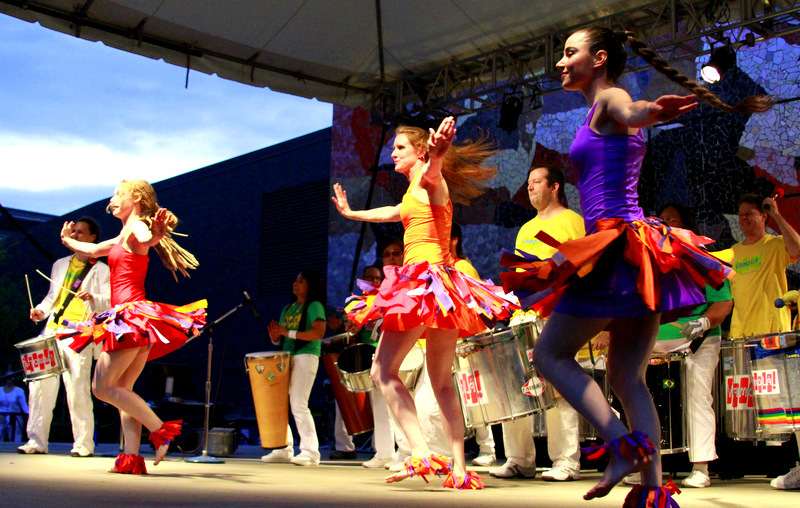 VamoLá has delighted Seattle World Rhythm Festival participants with their joyful, infectious music for many years. Their high-energy drum and dance performance is the perfect finale for our weekend festival. In addition, VamoLá players generously hold workshop sessions that teach Brazilian rhythms, and play live music for dance workshops. VamoLá’s inclusive community spirit portrays what the World Rhythm Festival is all about! I am so glad I hired VamoLá for my friend’s surprise 40th birthday party. The musicians and dancers were the hit of the party! Everyone is still talking about how great they were. They brought so much life and excitement to our gathering that it was impossible not to have a good time. Their obvious passion for music and dance got everyone up and dancing. Thanks for coming out and playing samba at the Sounders playoff game last weekend. VamoLá provided a great atmosphere! We certainly appreciated it! Thank you all for the energy, talent, and just plain fun that you brought to the eight parades you performed at Bumbershoot this year. Every parade felt like a party, due to the energy VamoLá extended and inspired in the audience! Thank you for being such a pleasure to work with. I look forward to working with you again.